Hello! For those of you who don’t know me, I am DSI’s Manager of Enterprise and Mobile Solutions. To christen our new-look web site, I wanted highlight some of the content and announcements from Microsoft’s TechEd NA 2014 conference. This is an exciting and important time for Microsoft. Not only are they transitioning to a new management regime, but Microsoft is moving to a “Mobile First, Cloud First” culture. If the cloud is important to your business, then Microsoft’s new approach and offerings will be of great interest. DSI is a Microsoft Azure Circle partner, so if you have any questions on Microsoft’s new direction, or would like to know how to build cloud solutions on your terms, feel free to contact us! On Monday Microsoft kicked off TechEd North America 2014 in Houston. TechEd is the technology conference geared towards IT Professionals and Enterprise developers, and focuses on the tools, software, and services that many enterprises rely on for storage, databases, communication, and device management. Microsoft has a new slogan – Mobile First, Cloud First – and it showed in the keynote. The opening keynote address was delivered by Brad Anderson, Corporate VP, Windows Server and System Center Program Management. Microsoft has been building out its cloud platforms over the last several years, basically replicating almost all of their major on premise services with a hosted version as a service with Azure as the platform to power these services. The key message from TechEd 2014 is that the public cloud and private cloud hybrid model is no longer the forefront of IT, but the new center. Not a single on premise product announcement was made this year. While the growth in hosted services has been huge over the last several years, not all services are replicated, and not all enterprises can or will embrace this model, but clearly Microsoft is hoping to move the conversation to a point where it’s difficult to not at least consider the cloud as an option, if not for core services, then at least for DR, single sign on, testing environments, and possibly special projects. The first product announcement was ExpressRoute, which enables private connections between Azure datacenters and on premise servers, or at a co-location environment with one of the partners. Clearly network speed, latency, and security has always been a negative against hosted services, and this service is supposed to help bridge that gap. To enable ExpressRoute, Microsoft has partnered with several network and telecommunications companies – namely AT&T, British Telecoms, Equinix, Level 3, Telecity Group, and Verizon. Bandwidth at General Availability is 10 Mbps to 1 Gbps with connections to Network Service Providers, or 200 Mpbs to 10 Gbps if connected through an internet exchange provider. ExpressRoute can be used in conjunction with the newly announced compute intensive VMs offering up to 16 cores, 112 GB of RAM, and 40 Gbps networking. The next service announced was Azure Files which is currently in preview. Azure Files is simply the ability to have a shared SMB connection as a service in Azure allowing sharing of a single file from multiple Virtual Machines and accessible with standard Windows APIs allowing applications expecting on premise servers to utilize Azure file storage without rewriting the application. Azure also has a new Redis Cache Preview based on the open source Redis project as a key-value store, and also announced was a new API Management framework to allow a client facing experience to publish, document, and code sample APIs. Antimalware software is now supported in Azure VMs, as well as additional security suites from Trend Micro and Symantec. Apparently this is one of the more popular requests, so Microsoft is taking the opportunity to check another box which may have prevented companies from migrating. Azure Site Recovery is another new offering – Disaster Recovery as a service. Azure can now be a DR target for a company’s VMs. This is a huge offering for a couple of reasons. First – disaster recovery planning is difficult, and expensive. Keeping multiple datacenters open, with high speed links among them, and enough duplicate equipment running at both sites to handle the entire load if one site was to fail is costly in both manpower and equipment. Now, Azure can be the other site, reducing the requirements to have effective DR. Most enterprises reserve DR for mission critical applications, but having the unlimited compute power (well, only limited by budget) of a cloud platform will enable this for a greater array of applications. The second reason this is a big offering is that it allows enterprises to test the waters with Azure by configuring Site Recovery and doing a planned failover of some services easily. They can then evaluate the results of hosting that service in the cloud, and gracefully fail back if they deem it won’t work for their scenario, or they can leave it in Azure if it does. Office 365 and specifically OneDrive for business now offers encrypted file storage. This is essential for many businesses to use any sort of cloud based file storage for regulatory or policy requirements. Also discussed, SQL 2014 has a new online transaction processing engine called in-memory which offers 5 to 30 times performance increases over previous versions of SQL Server, without any application modification required. This is in addition to the AlwaysOn capability to have a duplicate SQL instance in the cloud as a backup copy to add to the existing failover capacity of private cloud SQL. On the mobile front, Microsoft aptly discussed management of corporate data, Software as a Service, and Mobile Device Management (MDM) by using their recently announced Enterprise Mobility Suite which consists of three key pieces. First up is authentication. Azure provides identity and access management with Azure Active Directory Premium. This can be used to grant users access to applications and data with single sign-on. Second was data management. Though not a new feature, Azure Rights Management can be leveraged to embed the file capabilities into the file itself. It works with encryption to require the identity of the recipient of the file to be verified, and if found to be an authorized recipient, the file can be opened. The example given was if someone sent an email, but chose the wrong person to send it to. This protects the data inside the file. Finally, the MDM is provided by Windows Intune, which will gain support for the Samsung KNOX platform. Intune will provide containers and wrappers for applications a corporation needs to protect. Azure RemoteApp is also new. It’s a new version of the well-known Remote Desktop feature RemoteApp built to run on Azure. This allows LOB apps to be uploaded to Azure and deployed to clients from the cloud. Microsoft is currently under pressure in the enterprise from many companies – Amazon with AWS, Google, Apple, Blackberry, Oracle, and VMware to name some of the larger ones. Today’s TechEd keynote is a response to that pressure with new ways to deal with existing infrastructure issues in the enterprise. Last year they announced they were migrating to a devices and services company away from the traditional software company they had been in the past. With the push of Azure as the basis of everything announced today, it’s clear they are working hard to fulfill the services side of that equation. 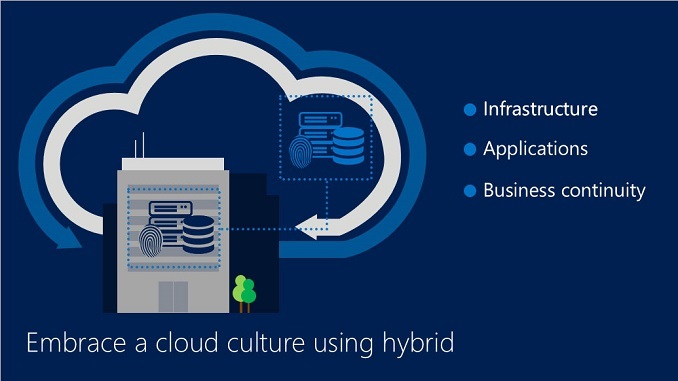 Microsoft has the advantage in the push to public/private hybrid clouds by being the underlying provider of most of the services for many enterprises, and clearly that’s an advantage they are looking to exploit as the push to the cloud occurs. Christopher Duda is DSI’s Manager of Enterprise and Mobile Solutions.